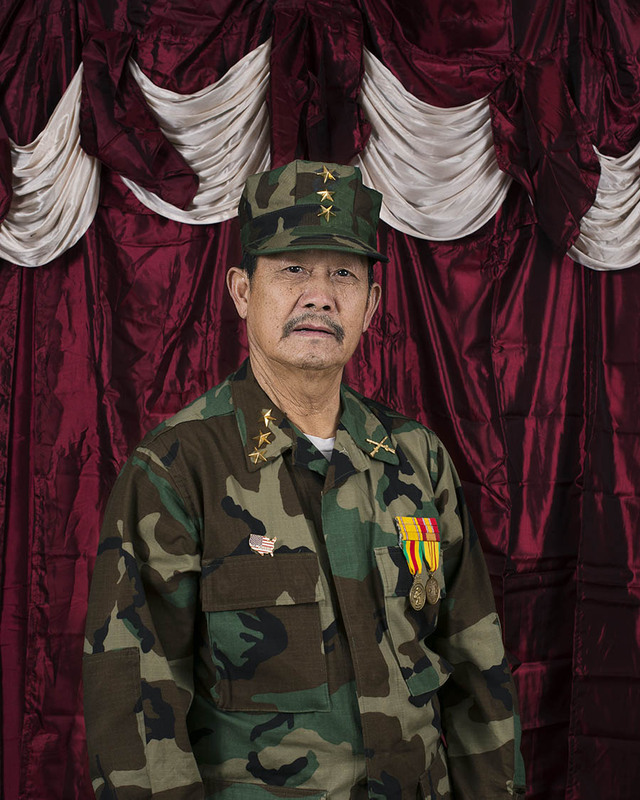 Pao Her’s photography exhibition, Attention, focused on the importance of military service to Hmong-American identity. 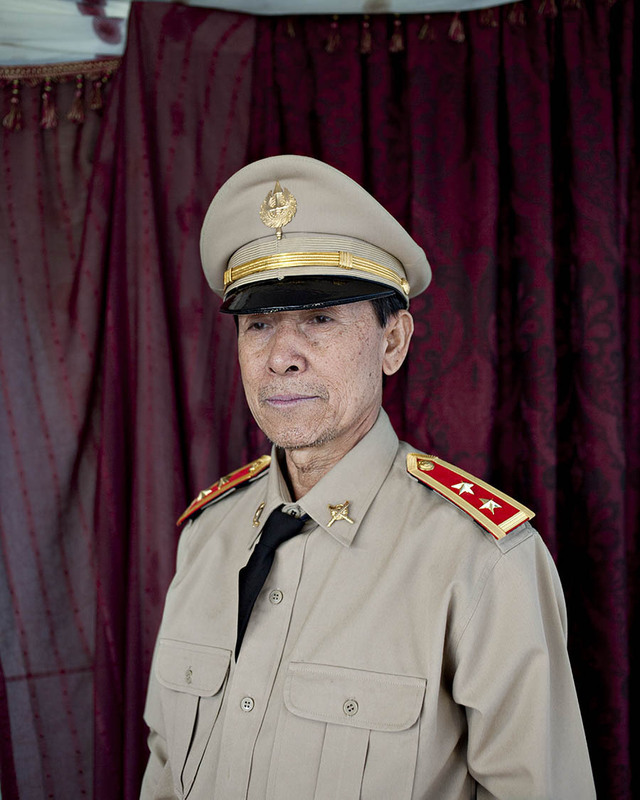 In the 1960s, the CIA enlisted Hmong and Laotian soldiers to fight a secret war alongside the conflict in Vietnam, soldiers the United States still does not recognize as U.S. veterans despite their sacrifices on behalf of the U.S.. The men that Her has photographed, in the tradition of classical paintings of generals, are veterans of that war—excluded from subsidized health services, refused the right to be buried in national cemeteries, and disqualified from wearing U.S.–sanctioned military uniforms and medals. Here, they stand proudly. 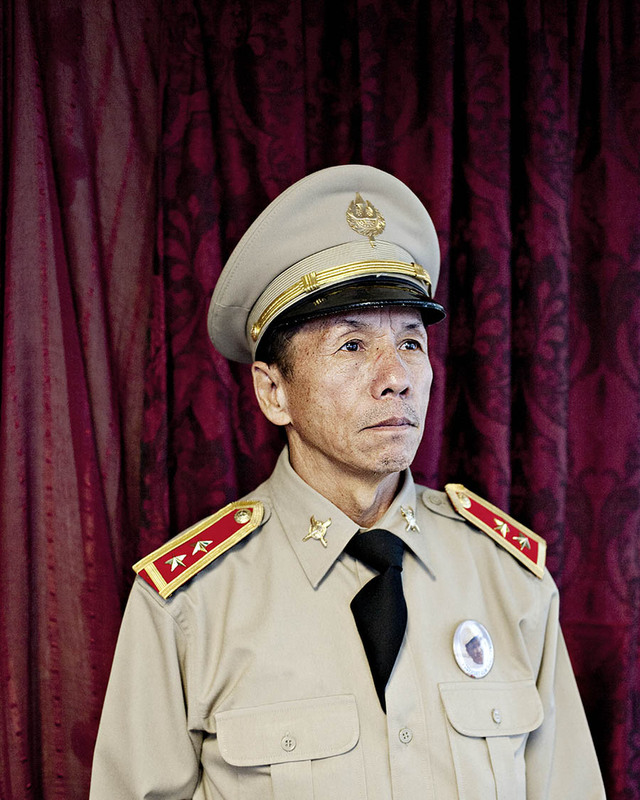 These Hmong Army veterans have awarded one another medals based on their oral testimony. Her sees these portraits as neither advocacy nor criticism. The installation magnifies a particular effort in our common hope to be recognized. 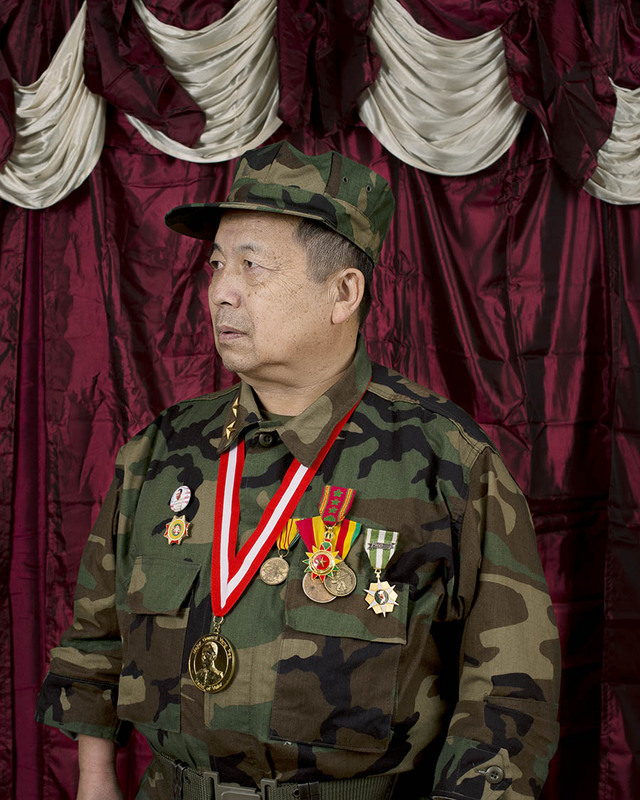 The medals in the case are a selection of those worn by the Hmong veterans in these photos. They include Laotian military medals, including General Vang Pao commemorative Medal, Order of Reign Medal, and General Vang Pao Issued Medal; United States military medals such as Air Force Good Conduct Ribbon, American Defense ribbon, Navy Pistol Ribbon, Army Overseas Service Ribbon, Army Overseas Service Ribbon, Coast guard Combat Action Ribbon, Coast guard Combat Action Ribbon; and Vietnamese military decorations such as the Republic of Vietnam Ribbon, Vietnam Service Medal, Vietnam Service Ribbon. “Attention!” is called when an officer enters a room occupied by enlisted personnel or cadets. I photographed these Hmong Vietnam War veterans from California, Wisconsin and Minnesota using tropes from the 19th century general paintings, Civil War soldier portraits and official presidential portraits. I did this to highlight their service in the Vietnam War because the United State military does not recognize them as American veterans. And because they are not recognized, Hmong veterans buy their own uniforms, medals and ribbons to insert themselves in the United States military and history. The uniforms they wear are important because it serves as a reminder of their services and their desire to be recognized by the United State Military. For these veterans, the war and their services are reminders of a life they gave up in Laos for their American allies, the very life they hope to someday go back to. Watch a video of Pao Her. 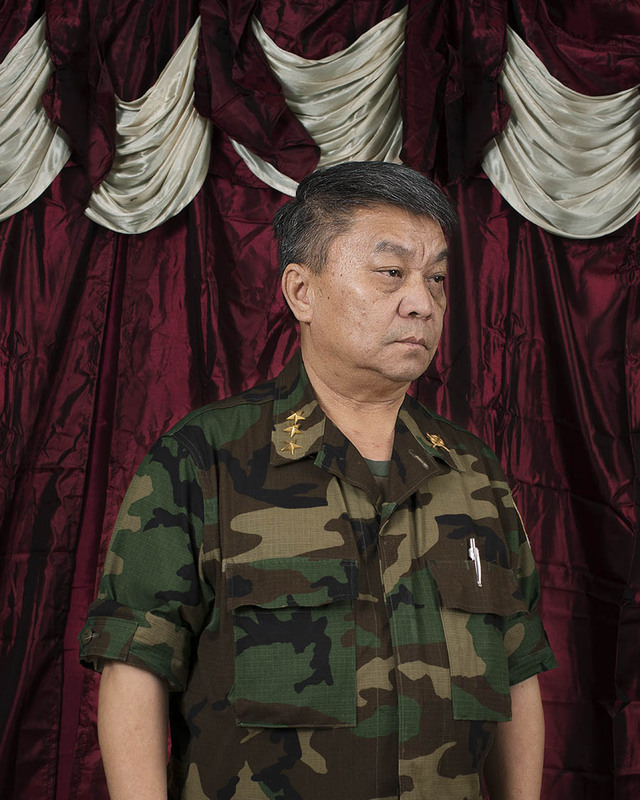 Read more about the secret history of the Hmong Army and the story behind these photographs at MIA Stories. Pao Her: Attention. Minneapolis Institute of Art. April 16 - June 5, 2016.